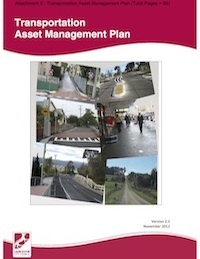 The Launceston City Council – Road Asset Management Plan is available here. The Lauceston Council Transportation Asset Management Plan follows the same outline as other council TAMPs in Australia. The TAMP focuses on levels of service, based on consumer expectations and strategic goals, future demand, lifecycle management, a financial summary, and a plan improvement program. The document includes a “Road Map” for preparing a TAMP. Current levels of service are also described using key performance measures, then compared to an optimal level of service as established by the agency. Risks, including treatment plans, are also addressed. This document includes the following sections: Asset Valuation, Communications and Reporting, Financial Plan, Future Demand, Introduction, Inventory and Condition, Investment Strategies, Levels of Service, Lifecycle Management, Objectives and Measures, Process Improvements, Regulatory and Legislative Requirements, Risk Management.